Living in Honolulu usually means you’ll have guests who want to visit frequently. But what if you don’t have enough space for a guest bedroom? The solution is simple: build a custom wall bed. The convenient fold-down bed is perfect for hosting guests when they’re visiting, and serves as a great space-saver that’s folded up and into the wall when you need the space for something else, such as a home office or living area. A wall bed, also known as a Murphy bed, is a convenient fold-down bed that rests in the wall when not in use, so you can use the “bedroom” for any other purpose during the day: such as a home office, playroom or something else. Standard Wall Bed: The more standard configuration, this option feels more like a traditional bed. A more popular choice, the vertical system allows the user to have access to both sides of the bed. Usable storage is included to make the most of the space. 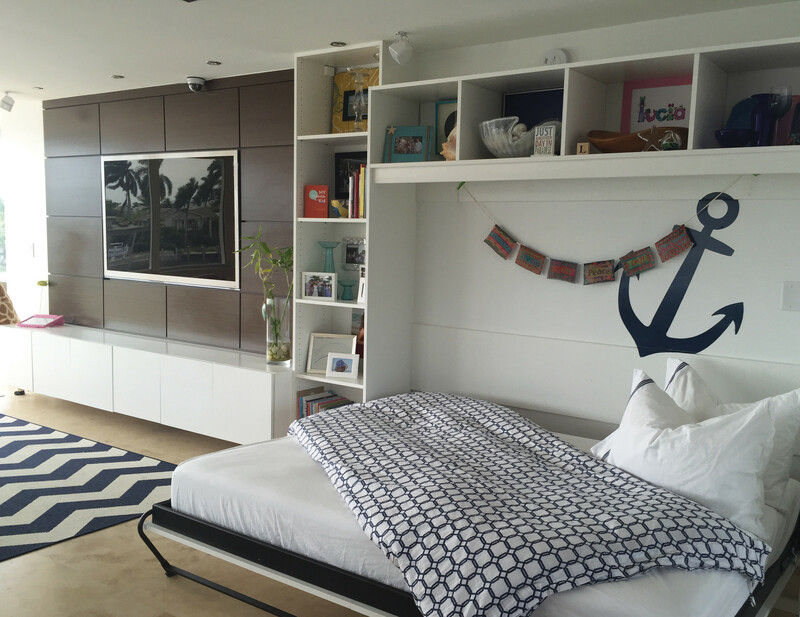 Side-Tilt Wall Bed: Ideal for use in a playroom or office, this configuration perfectly utilizes available wall space. An ideal solution when square footage is minimal, this wall bed has less of a footprint into the room when opened. Usable storage is also included to make the most of the space. By installing custom cabinetry and a comfortable bed system, guests will easily feel at home. A pullout drawer with a side table acts as a nightstand. Reclaim your space and enjoy having a home office, playroom, fitness room or something else. Get started today by contacting the California Closets Honolulu team to receive your complimentary in-home expert design consultation. Or visit our Kahala showroom and see our product in-person.